zoning vote hands Casino Gang a blank check. 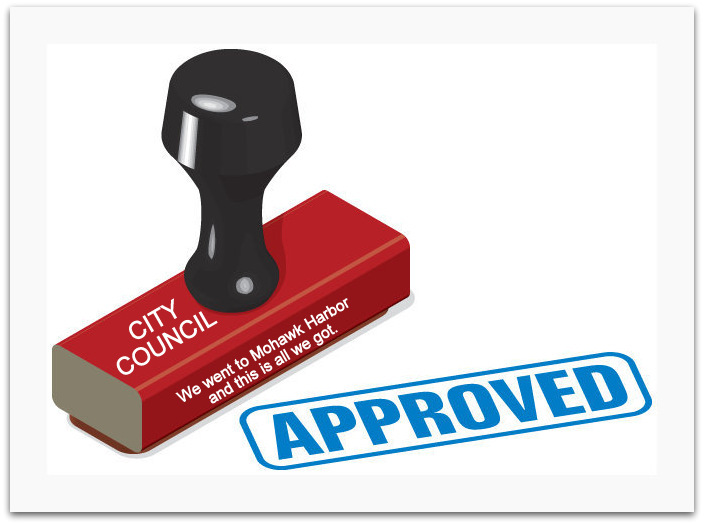 . .
We need some new cliches and metaphors to describe the way Schenectady’s ever-grateful and gullible City Hall has again kowtowed to every wish and whim of the Casino Gang (The Galesi Group, which is the owner/developer of Mohawk Harbor & Rush Street Gaming, the erstwhile operator of Rivers Casino at Mohawk Harbor). The links in our righthand margin will take you to posts describing the issues raised and the questions never asked (much less answered) by the set of amendments to our C-3 Waterfront Mixed Use District, which were passed into legislation last night (by a vote of 4 yes, 0 no and 1 Abstention (Vince Riggi [I]). They are said to be what the Gang at Mohawk Harbor needs to make their/our dreams a reality. You can read news reports in the Times Union, “City Council approves new waterfront zoning: Rules let buildings be up to 10 stories tall” (by Paul Nelson, Feb. 9, 2015), and in the casino-smitten Schenectady Gazette, “Schenectady council OKs zone change for casino site” (by Haley Vicarro, Feb. 10, 2015). “Minor Clarification”. Galesi COO David Buicko has said often that the C-3 amendments are minor, and mostly “clarification”, and not even really focused on the casino. By the way, Galesi told Metroplex the buildings around the embayment would be 3-4 floors, and that they wanted a 110′ gaming facility. Buicko now says he wants the 110′ maximum to use around the bay-marina, if the market looks like there will be a lot of demand. How many buildings will be over 100 feet? permitting the casino and its hotel and parking structure, etc., to have 19,000 sq. ft. of signage, when under Art. IX it might need an area variance to have more than about 200 sq. ft. It might be better to put your trust on a pair of dice, because the only thing the amendments clarified is that the Casino Gang is in charge of this Company Town. The one business most likely to fail that test, the Casino, does not have to take the test. At this point, I’d like to see the requirements of §264-61(2) applied to the Casino by a change in section H of the C-3 ordinance, or by drawing the Casino back into §264-61, even though it is part of Article IX. Note: This reminds me that I have never heard the City Council or the Planning Commission mention why our signage regulations have been made inapplicable to the Casino, much less the potential ramifications. Was it so that no one would notice how much more generous Council has been to the Casino than to any other Schenectady business erecting a sign when they redid the Art. IX Signage Schedule? If I were a praying man, I’d be asking St. Thomas (known for Doubting) and St. Nicholas (who is said to protect folks from Misunderstandings, Robberies, and Wolves) to take special care of Schenectady, especially along Mohawk Harbor. This entry was posted in politics, Schenectady Casino, Zoning/Planning by David Giacalone. Bookmark the permalink.